Schematic diagram showing the Prudhoe bay Surface Facility. Instead of detail simulation of all the components in the facility, Pressure, Volume and Temperature at key locations in the facility served as the control points for the entire facility. Since the major components are to remain in place for the foreseeable future, they are controlling the PVT at the key locations. Therefore, as long as we can capture and successfully model the PVT behavior at these key locations, there may be no need to model every single component in the facility. State-of the-art in AI&DM, as presented in IDEA, were used to build an intelligent model that would accurately represent the PVT at any given location in the facility. Ambient temperature has a dominant effect on compressor efficiency and hence total gas handling capacity and subsequent oil production. Gas compression capacity is the major bottleneck to production at Prudhoe Bay and typically field oil rate will be maximized by preferentially producing the lowest GOR wells. As the ambient temperature increases from 0 and 40 oF, the maximum (or "marginal") GOR in the field decreases from approximately 35,000 to 28,000 scf/stb. 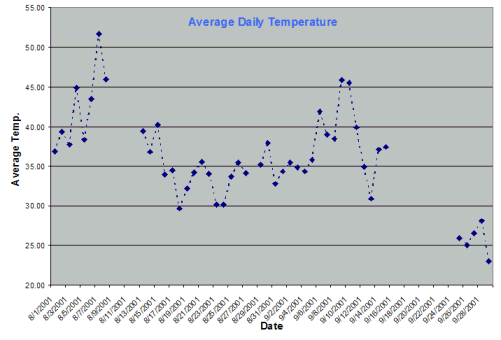 A temperature swing from 0 to 40 oF in one day equates to an approximate oil volume reduction of 40,000 bbls, or 1000 bopd per oF rise in temperature. 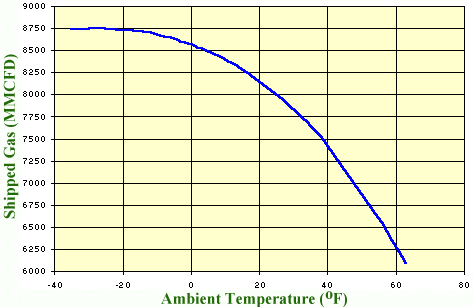 The reduction in achievable oil rate, per degree Fahrenheit increase in temperature, increases with ambient temperature. This is due in part to the increase in slope of the curve of shipped gas versus temperature, and also to the reduction in limiting or "marginal" GOR as gas capacity decreases. significant reduction in gas handling capacity is observed at ambient temperatures above 0 oF. 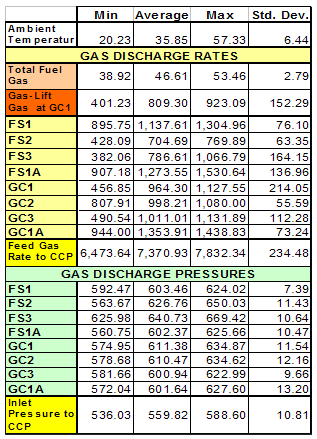 To maximize total oil rate under a variety of field conditions it is first necessary to understand the relationship between the inlet gas rate and pressure at the central compression plant, and the gas rates and discharge pressures into the gas transit line system at each of the separation facilities. Gas capacity constraints start to affect oil production at about 0 oF, with increasing impact as the temperature increases. The estimated benefit of this tool for optimizing oil rate during temperature swings and equipment maintenance is 1-2 MBOPD for 75% of the year. 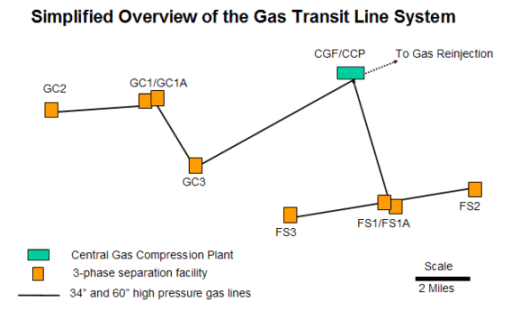 Attempts were made to develop a deterministic model of the gas transit system using commercial pipeline modeling software. However, it was extremely difficult to obtain sufficient historical data to validate the model. Development of a neural network model was undertaken to determine if this approach would provide a robust description of the observed gas rates and pressures with less stringent data requirements. Assuming that there was negligible hysteresis in the system. Initial results were very encouraging, suggesting that this is a valid approach, albeit limited to the data range used to train the model. Temperature plays a key role in this operation. The data used to build the neural network model was averaged on an hourly basis. Data from a total of 46 days was represented in the data set. 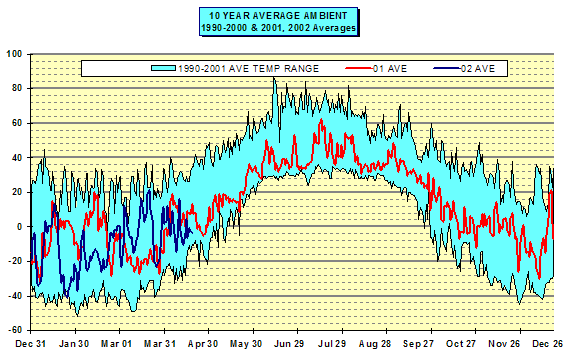 The data starts with the first day of the August and ends with the last day of September 2001. Ranges of the parameters that were used during the development of the network models. Following figures show the accuracy of the neural network models that were built using IDEA to model the PVT behavior in Prudhoe Bay surface facility. Such models were built and validated by blind data for all the facilities and the Central Compression Plant. 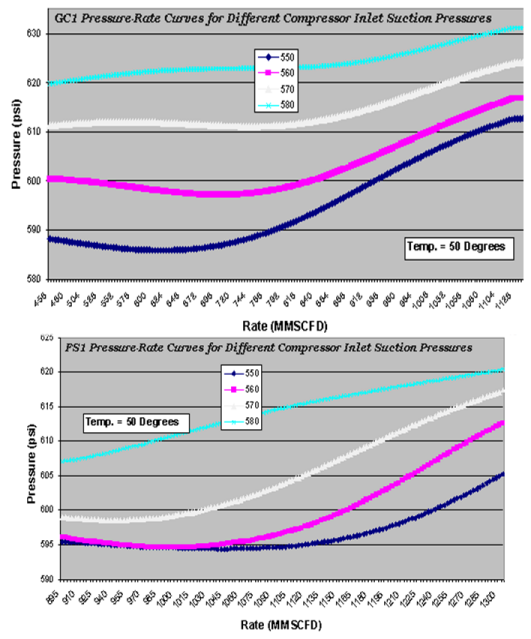 Central Compression Plant Inlet Pressure and Rate Models. Actual measurements are on the X axis versus modeled values on the Y axis. Similar models were built using IDEA to model the PVT behavior for all the separation facilities in Prudhoe Bay surface facility. Following table shows the accuracy of models. Separation Facility Gas Discharge Model. IDEA allows development of Type Curves for any model that is developed. Following are a series of Type Curves that were developed for Separation Facilities at Prudhoe Bay. Type Curves for the Separation Facility Gas Discharge Model.